A pre – event survey commissioned by the Liverpool and Sefton Chambers of Commerce and Professional Liverpool has revealed that private sector businesses believe that devolution from central Government is critical to the future of the City Region. 91% of those surveyed stated devolution of power is critical to building a successful Liverpool City Region were in favour of greater freedom and flexibility over the region’s budget and priorities, with 31% confirming they welcomed the idea of an elected Mayor taking responsibility for decisions affecting the business environment. However, 44% of respondents said they did not believe that they are adequately engaged in the economic planning process. These results are reinforced by the recent findings of Think-tank IPPR North survey announced this week. The research was conducted ahead of a panel breakfast hosted by the Liverpool and Sefton Chambers of Commerce in partnership with Professional Liverpool. 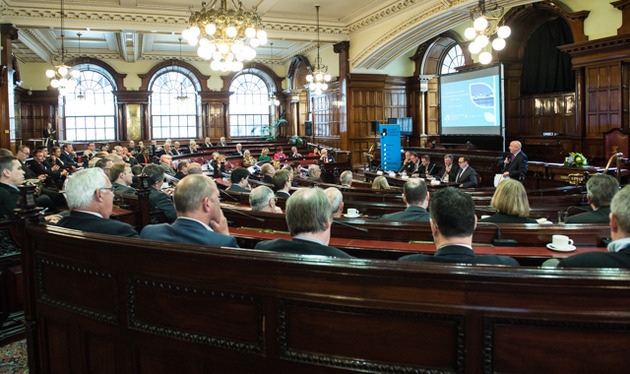 The ‘Devolving, Researching, Connecting: Building a Successful City Region’ event took place at Liverpool Town Hall on Friday 26th June. With George Osborne’s vision of a Northern Powerhouse stating that devolved powers to the Northern cities will boost the local economy and attract inward investment, there is increased importance in ensuring that the Liverpool City Region is not left trailing behind. Over 100 representatives from across Merseyside gathered to debate the importance of the devolution deal and how collaboration between the Local Authorities, the LEP and the Combined Authority is vital to ensuring a successful and prosperous economy. Host, Rob McLoughlin OBE, introduced the panel which included: key note speaker Professor Greg Clark CBE, Ged Fitzgerald, CEO of Liverpool City Council, Cllr Phil Davies, Chair of Liverpool City Region Combined Authority and Leader of Wirral Council, Robert Hough CBE, Chair of Liverpool LEP and Andrew Cornish, CEO Liverpool John Lennon Airport. Delegates and panellists discussed a range of issues such as the implications that devolution of power would bring as well as related drivers for businesses including cross-cutting themes such as transport investment, apprenticeships, public investment in housing, business rates and support for new businesses/start-ups. The speakers gave their views on the extent to which the Liverpool City Region is capable of successfully delivering devolved powers and if an elected Metro Mayor is the key, which has differing views amongst the leaders. Thinking beyond the traditional idea of city success, Professor Greg Clark, CBE launched proceedings stating: “A successful city attracts talent and can repopulate easily when it loses population. It is able to grow businesses from scratch and attract major corporates. It knows how to leverage its assets such as universities, airports and historic city centres and world class docks, as well as knowing how to build its identity and reputational brand. It knows how to utilise both its core and distributed leadership, and city leaders should be focusing on getting these right before rushing into a deal. Giving the perspective of the Local Authority, Cllr Ged Fitzgerald, stressed: “We are in agreement with the private sector, we would all like to see more devolution from the national government to a local level and I welcome the views of Liverpool businesses. We were the first authority in the country to do a city deal under the last government however one size does not fit all and we need to have a deal that is right for Liverpool. When asked to identify key priorities they would like to feature within the devolution deal it was in agreement that: transport and connectivity, business growth and skills, repopulation and housing were important to both the public and private sectors. Agreeing, John Hall, Chief Executive of Professional Liverpool, said: "Our concerns are that our members feel disengaged with the devolution process, we can see from the poll that business want to be involved in the decisions that are going to affect them. We need leadership, collaboration and unity. We should be a ‘United Liverpool’ using the attack brand of Liverpool to fully capitalise on our unique asset base. There needs to be an end to discussions around a referendum, it is a waste of time, money and effort that should go into deciding on a Metro Mayor."